He might run the world's biggest social networking site, but not even Mark Zuckerberg is immune to being hacked. The Facebook founder's accounts on sites including Instagram, Twitter, LinkedIn and Pinterest appear to have been briefly compromised on Sunday. A hacker group called Ourmine, which has more than 40,000 Twitter followers, claimed responsibility. The group bragged about the alleged hacks in a tweet and invited Mr Zuckerberg to contact them. "Hey @finkd we got access to your Twitter & Instagram & Pinterest, we are just testing your security, please dm us." The Twitter account has since had the offending tweets deleted. Mr Zuckerberg has not sent a tweet from the account since 2012. Developer Ben Hall tweeted a screenshot of Mr Zuckerberg's "hacked" Pinterest page. 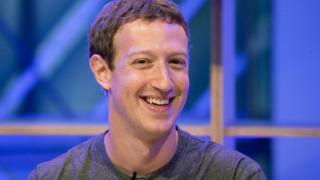 The BBC understands that Facebook's security systems prevented Mr Zuckerberg's Instagram account from being accessed. The photo-sharing service is owned by Facebook. Some reports suggested that the 2012 hack of LinkedIn may have been responsible for the breach. Last month it was reported that 117 million LinkedIn username and password combinations stolen four years ago were being sold on the dark web for 5 bitcoins - worth about $2,300 (£1,595). The passwords were encoded, but in a form that appears to have been relatively easy to unravel. The account, on which he has posted just 30 images, has more than 600,000 followers.